The last update CFW Symbian Anna for Nokia 5230 5800 5530 X6 , and thus officially said goodbye to Symbian S60v5 . This new version fixes all bugs that we reported in the previous version, updated all native applications to its latest version and after reading many documents we want to present the best firmware that we have created, focused on the most of the phone with an excellent command of RAM you will notice instantly, additionally you will enjoy all the characteristics that have the new equipment through the new Nokia Symbian Anna v7.9. NOKIA 5530 All 5530 regardless of the RM, or version or anything ... All! Effects renovated, with kinetic response. New Nokia Pure Font much more readable. Changes in the system cache for apps to faster. Firmware thorough cleaning to get more free space. can my se vivaz do that thing?help. hello.. Bro, this firmware have the english version (english language) ?? 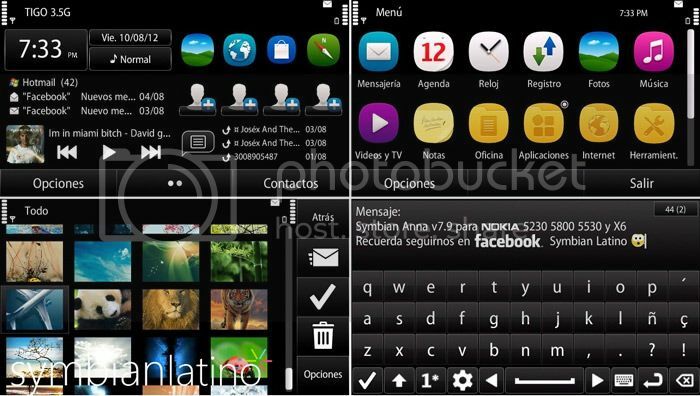 Thanks.. bro.. this symbian latino it very cool for my phone.. This cfw has been alive for several years, please check http://www.symbianlatino.com and also tranlate page to english on symbian latino otherwise yuo can read portuguese/espanol? bro i dint get it... is this just a cfw or is the os changed to anna?? i mean can v install all anna apps? ?